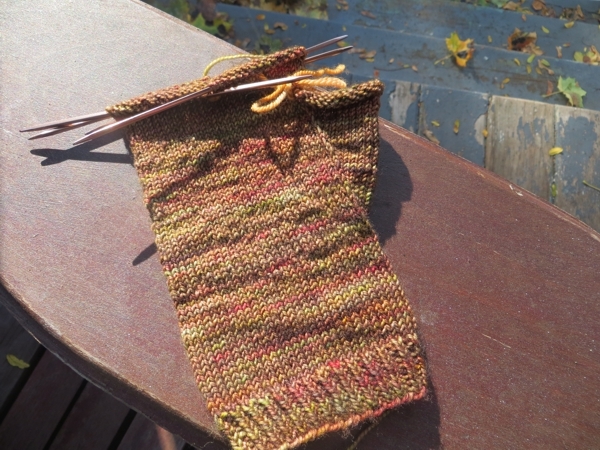 Today I am writing about yarn so precious and special and important you almost can't bear to knit with it, in case you make a mistake and ruin it. Do you have yarn like that? The only project I have on the go that fits this particular bill is the fingerless gloves I've been making up as I go along, knit with Viola yarn in the 'orchard' colourway which I'm pretty sure (unless I'm mixing them up with 'gnarled') Emily told me was the result of a mistake in the dye bath. Mistake, you say? Make more of them please. Other than my complete fear of failure and lack of concrete pattern I don't know why these little gloves are taking so long, unless it's because I started too many things at once and then insisted on working on each of them in turn. But that can't be right, surely. 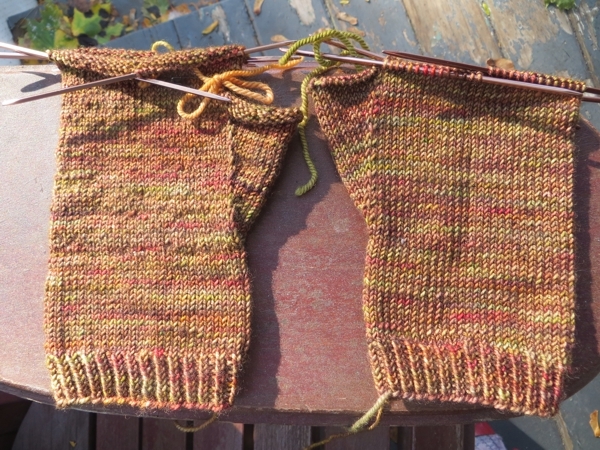 They're both up past the thumb holes now, and one is almost ready for some fingers. Yay! Except that you can really tell which one I had to rip out and reknit three times, can't you. Think all those bumps and gnarlies will block right out? Think I'll care much, once I have two cute handwarmers on me? 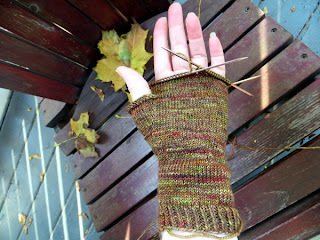 1/ once I have the kinks worked out, I want to make a second pair for somebody's Christmas gift. 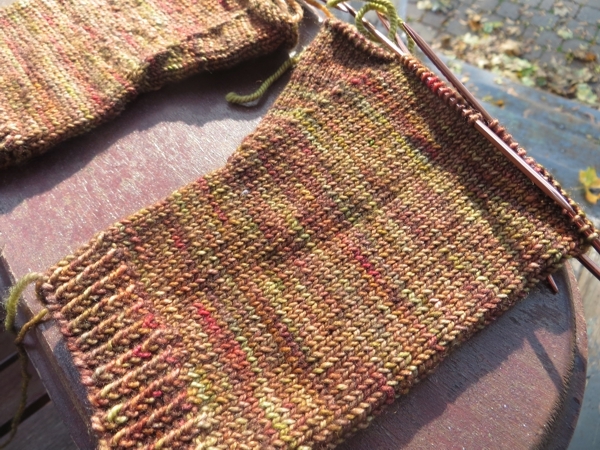 2/ I need these needles back for socks. We're well into fingerless glove weather now; pretty soon I'll need actual mitts and these colours aren't nearly as cute for spring as they are for fall. Plus if I can I get them ready in time, I bet these things will be awesome to wear while raking leaves. And super plus, I can stop worrying about this yarn I can never replace, and just enjoy looking at it every day. Wish me luck, and have a great day, and I'll see you tomorrow!